The artistic vocabulary of the dominant culture in which a particular megillah was created usually affected its decoration. The lack of figural representation in this scroll from North Africa is due in no small measure to the Islamic milieu in which it was produced. In countries under Muslim rule, depictions of the human form were often forbidden, or at the very least, discouraged. Consequently, megillot, as well as other decorated Hebrew manuscripts produced under these circumstances, rarely contain figural art. a separate and delicately curved, pointed horseshoe arch. The arches form a long decorative arcade along the length of the entire megillah. The spandrels and columns that support the arches are filled with orange and green floral and geometric patterns. These motifs were imported into North Africa by the Jews who migrated there after the expulsions of Spain and Portugal in 1492 and 1497. Many of North Africa’s relatively small Jewish communities were suddenly inundated by these megorashim (expelled ones) who quickly outnumbered the toshavim (indigenous residents) of these North African communities. 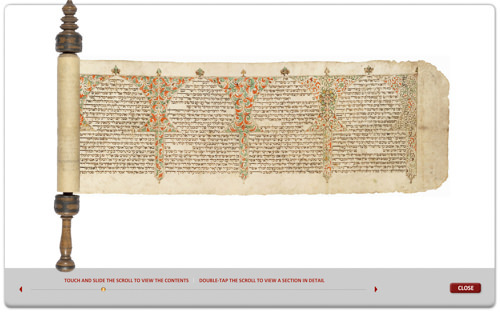 The artistic traditions of the Sephardic newcomers had an impact on the decoration of Hebrew manuscripts. Their style of decoration, which lasted for hundreds of years, can be seen in the embellishment of numerous nineteenth-century Moroccan Hebrew codices, scrolls, and ketubbot. it is possible to determine the most likely center of production of this work. The pointed horseshoe arch with spare-ground foliage decorating its spandrels is found in decorated marriage contracts created in Meknes as early as 1813 and continuing through the nineteenth century. 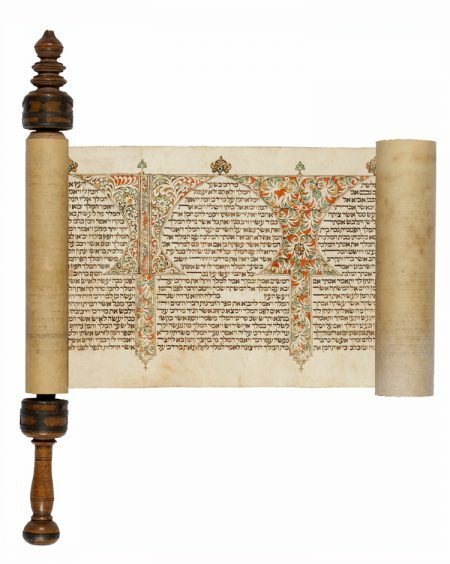 This Esther scroll was most likely executed there. It differs in appearance from the ketubbot, however, in the use of meticulously written square Sephardic letters for the text. The careful attention to detail in the creation of lines, words, and letters, render each text column of this megillah an exquisite calligram. selected literature Sabar 1992, pp. 168–191.